While this barcode works and is perfectly scannable, it may not be as useful as possible. For example, if you printed a bunch of barcode stickers using the old font for many different products, you wouldn’t be able to distinguish them. While it’s a basic font, it should work for 99% of small businesses looking to implement any sort of internal barcode system. The font supports letters A-Z (in caps), numbers 0-9 as well as characters such as an asterisk, dash and a period. We also stress tested the font and it seems size 24 is the minimum font size to ensure your codes will be readable when using a basic inkjet printer. We did notice, however, some codes could be read even when printed at size 16. Just as a reminder, for your codes to work with a scanner, you have to include the * characters at the beginning and end of your code. This tells the scanner when to start and stop scanning. Where can I download the Code 39 font? The font is currently hosted download.com. 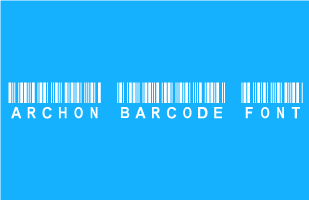 You can download the Archon Code 39 Barcode Font here..
How do I get the Code 39 font installed? It’s really simple to install a font in Windows 7, 8, or 10. Simply double click the font file after you download it and click “install” on the next window that pops up. You can also try right clicking the “Archon Code 39 Barcode.ttf” font file and select the install option right from that menu. The font will be ready to use in all your programs including Microsoft Word and Excel. You usually don’t have to restart any programs or even the computer for that matter. For other versions of Windows, you can install the font by placing the “Archon Code 39 Barcode.ttf” file in your fonts folder. This is usually under C:WindowsFonts or C:WINNTFonts (can be reached as well by the Start Menu > Control Panel > Appearance and Themes > Fonts). For OS X 10.3 or above, all you need to do is double click the font file and click the “install font” button at the bottom of the preview. Just like Windows, you can also place the Font file in your fonts directory. For macOS, you can place the font file under /Library/Fonts (for all users), or into /Users/Your_username/Library/Fonts (for you only). For more information on on how to use a Code 39 such as this, you can see our original free barcode post here. If you’re looking for more detailed information on how to set up a complete barcoding system for your business, you can also download Barcode Your Small Business from Amazon.com. 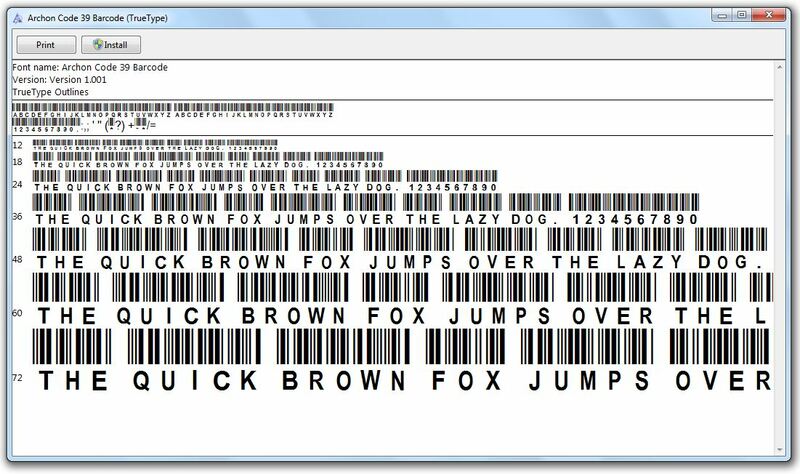 Need a barcode scanner to go with your barcode font? We now sell barcode scanners! 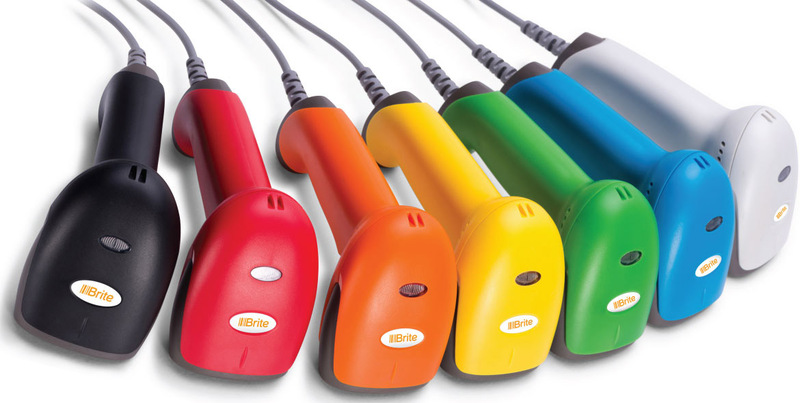 The inFlow USB barcode scanner comes in your choice of 7 different colors and simply just works! It’ll scan almost all 1D barcodes such as UPCs, EANs, Code 3 of 9, Code 128 and much more. Simply plug it in and you’re good to go! All scanners come with a full 60 day money back guarantee and full no hassle 1 year warranty. You’ll love using it in your business! Need software that can take full advantage of your scanner? We’ve been making inventory software for over a decade, and we’ve helped thousands of small businesses get a handle on their inventory. Great explanation! Everyone always over complicate the explanations about bar coding. Finally someone did the opposite! Thank you for the great explanation! Be sure you unzip the folder before you try to install the font. Have you also tried it on another machine? Just tested it again on my Windows 10 machine and it seems to work no problem. Is there an accompanying dll for Archon code 39? I’d like to use this with Crystal Reports, but CR requires a dll file. I’m sorry Bill, I’m afraid we do not have an accompanying .dll. Our code 39 font is just the .ttf file we’ve linked to on Download.com. The ‘\’ is a segment seperator, but it is creating a space in the barcode. Any ideas to work around this? I gave this a try and it looks like it’s creating a separator in the barcode because ‘\’ is not one of the supported characters in that font set. Our Code 39 font only has the letters A–Z and the numbers 0–9, so using any symbols other than those would result in a break in the barcode. If you wanted to use a space separator and maintain the barcode, you’d have to choose one of the characters provided in our font set. Sorry about that! Could you please tell me if the Archon Code 39.ttf Font is free to use or is there a trial period on it if downloaded. Hmm, this barcode font is definitely scannable on any 1D scanner. If you’re having trouble with it, I’d suggest trying to make the barcode a bit bigger, or make sure that your barcode is printed out (some scanners aren’t able to scan screens). How to get the free ebook on barcoding setup..
Hi Antoine, sorry about that, something is up with the link. I’ll email you a copy of the book today. I think this font is great, but could use just one adjustment. I have used Arcon 39 code font in NOTEPAD and printed it. But it is not scanned. What can i do to solve this problem ? Hi Anant, hmm, that’s strange. If you’ve printed the CODE 39 font onto paper, it should work immediately with any scanner that recognizes 1D codes. If it doesn’t, we’d suggest increasing the font size and trying again, or scanning from a closer or farther distance from the paper.